Driver (s) : (We used this as our mystery picture for our 8/29 Trivia question.) It is Jackie McLaughlin. Comments: Another great shot provided by Russ Dodge. 12/04/05 Sam Corrice Sure looks like Jackie McLaughlin, my first racing hero. Jackie is wearing the same shirt rolled to the elbow as in "Faces" page 2a (car # 69). 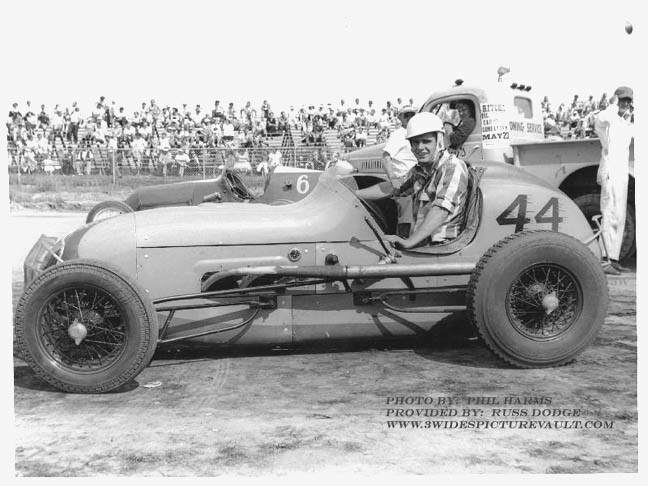 I know that Jackie drove sprints in the early 50's, but this is the only photo I have seen.